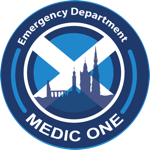 Edinburgh Emergency Medicine - A year of innovation in the ED…moving forwards. A year of innovation in the ED…moving forwards. It is now a year since the Kaizen Chief team was formed, 9 months since the morning ED huddle started and 6 months since the department embraced the change to our triage system brought about by the introduction of the One Patient Pathway. I would love to say it has been a breeze, but that would be a lie. There have been highs, lows and a few sleepless nights. Above all this, though, there has been amazing team work, both from the Kaizen Chiefs and from the wider ED team. Our team is awesome and together we have transformed the way we work, the results we get and our patients’ experience. The last couple of months have been hard. There have been lots of people requiring our services and the hospital flow has been sluggish at best. Despite this we have maintained our performance against the four hour standard and the reduced ED length of stay that our changes have brought about for our patients. Graph 2. 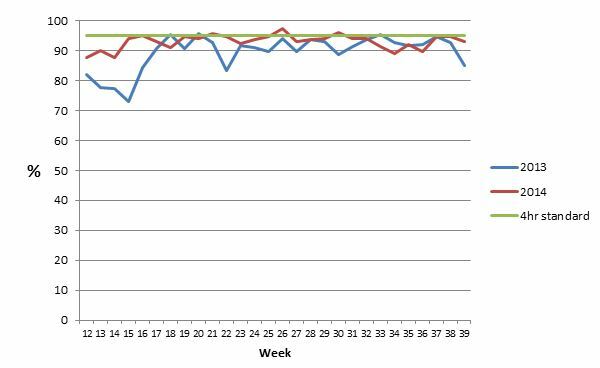 This shows the ED length of stay for our patients over the same time period. Not only have we reduced the proportion of patients spending over 4 hours in the ED but we have also increased the proportions of patients discharged from the ED within 3 hours of arrival, whilst treating 5% more patients. The real question is whether these improvements in performance translate into an improved patient experience. One of the ways we measure this is through the Tell us Ten Things questionnaire. Yes, there is a reason the receptionists slip them into every set of notes!! The results make great reading - we’ve improved over all areas when you compare this year to last year. Not only have we had these great compliments but also complaints are down; 20 complaints received for March-August 2014 compared with 55 for the same period in 2013. So, how do we move forward from here? You’ll remember that the word Kaizen comes from the Japanese term for the process of continuous improvement. Moving forward we’re open to ideas from the team on further improvements. There are already more efficient pathways for specific patient groups coming into effect, most notably the acute stroke and fractured neck of femur patients. We also want to build on the enthusiasm for improving the quality of care we deliver to our patients. The teaching room is the hub of learning and, if there are specific topics you would like us to explore, please let us know. October is ‘frailty month’, Jon and his team have created an amazing display in the teaching room full of helpful nuggets of information. The ED unit meeting on November 5th will be frailty themed and help consolidate the knowledge we gain over this month. It would be great to see a full turnout. If you are willing to help with the organisation of the meeting or, if you have any cases you feel it would be educational to discuss, please can you tie in with Kate, our master organiser?! So in closing off this blog I’d just like us all to remember how far we have come in a short space of time. Don’t let us lose this energy and drive for continuous improvement. Finally, thank you all, for your support, your hard work and your patience.